Glover demonstrates the Mayfair board game, Pack & Stack, by Bernd Eisenstein. It's moving day! You have lots of boxes to load, and a truck to load them into-but how are they going to fit? Maybe on their ends? Stacked on top of each other? You'll have to pack your unique truck as tightly as possible, and you lose points for packing too few pieces on your truck, or for leaving pieces you can't fit behind. Can you pack'em, stack'em and rack'em with the best? Pack & Stack is a fast and funny, wild and crazy game about moving stuff on all sorts of odd trucks. Every interactive turn is a new adventure, where all the players discover new loads, grab new trucks, and then gamble on their planning and packing skills. So, test your wits and find your cool. It's time to get packin' and start stackin'! Pack & Stack is a spacial problem solving game that plays fast and quick, rewarding fast thinking but punishing those who don’t think long enough. The game mechanics themselves are simple. Easily taught in a few minutes, the game’s real depth comes from the random method of allocating just how much stuff a player has to load in to their moving truck. Each die corresponds with wooden “bricks” of the same color, and each color of brick has a different volume, ranging from 1×1 to 1×5. The game’s components are top notch; high quality, visually engaging, and feel quite durable. Certainly worth it for the price the game. Rolling these dice is only half the job however, as they you must quickly find and claim a moving truck from a random assortment of tiles. The trucks all have different footprints for where the bricks can be stacked, and they have a certain height limit as well, creating vertical space that must be considered when picking what truck fits your brick allocation needs the best. You cannot over fill a truck, and any pieces that don’t fit in to your plans cost you money, twice the volume they represent. You don’t want to waste moving space however too, so any unused space in your truck costs you as well, one money for every vacant space. These two balancing factors really keep the game from becoming a simple “grab and pray” game, and encourage some critical thought. The fact the trucks are claimed in real time by all the players simultaneously really adds a air of urgency to the game. The only issue with the game is replay value. The game is great for a single play through, but it doesn’t lend itself to an immediate replay. By the end of the game, most players feel it’s time to move along to something else. Certainly not to say the game isn’t worth the investment; as a filler game between more meaty games, Pack & Stack really shines, but it doesn’t command the attention for a game night feature. I think this is a fun game, good filler between bigger games at game gatherings. For a party game, you get so engaged and eager at the grabbing of cars and trying to place the boxes. It`s quite a brain teaser. Have fun packing and stacking the cars!! All of us who have ever had to move know that moving is NO fun! Pack & Stack is a moving game, but it is loads of fun for all ages. The game is recommended for 10+, but we have had much younger players in our gaming group. Because there is no reading required to play, our younger players have had no difficulty in learning & playing the game – needing only minor help with the addition/subtraction at the end of each round. The playing pieces are colorful, and the wooden “boxes” of differing lengths and colors make it easy to play. The durable cardboard “moving truck” cards also have nice graphics. The game is fast-paced, so it keeps your interest, and it is easy to determine the winner. I recommend Pack & Stack for family gaming and parties, but it would also be a great classroom game because it increases spatial awareness, hones basic math skills, and improves money counting skills. The game is well put together and has nice pieces. It was easy to pick up and learn. But this is more of a luck based party game than a strategy game. I would suggest this more for starting gamers or kids. Power gamers and some avid gamers will probably have a hard time getting into this game since there is little to no strategy. 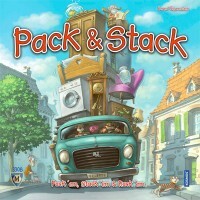 Add a Review for "Pack & Stack"